Thanks for checking out our Tripawds Amazon Selections. 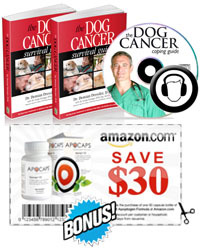 We hope you will find these book reviews and product recommendations helpful when researching the best care for your canine cancer survivor or other three legged dog. Our goal is to save you time by selecting items available at amazon.com that we think may benefit you. Find more help in the Tripawds Blogs and Discussion forums! Please feel free to contact Tripawds here if you would like to write a book review, or have suggestions for products we should include here in the Tripawds Amazon Selections blog. Thank you!